Nobody likes a shadow, especially New Englanders. It means a longer winter (thanks Punxsutawney Phil) and stubbed toes from running into furniture in dimly lit rooms. The last thing you think of when buying new light bulbs is whether or not there will be a shadow around the base of the lamp. Unfortunately, this is more likely than ever to happen with some new light bulbs available in stores. The best way to avoid these shadows is to make sure you purchase an omnidirectional light bulb that is ENERGY STAR® certified. What is an omnidirectional light bulb? We typically assume that the standard Edison light bulb that looks like an upside-down pear (also known as an A-line bulb) casts light out in all directions; however, the light rarely reaches directly underneath the bulb. In order for a light bulb to function as an omnidirectional bulb, it should cast a broad enough range of light that the base of the lamp isn’t left in shadow. Many cheaper non-ENERGY STAR certified light bulbs available today provide a narrow range of light that doesn’t reach the area around the base of the lamp. The image below depicts the difference between an omnidirectional light bulb and a non-omnidirectional light bulb for reference. Using an omnidirectional light bulb is important because it provides you with the light necessary to perform day-to-day tasks as you normally would. Imagine reading a book in your favorite chair next to a floor lamp that dispersed light in such a way that caused you to move your chair farther away from the lamp in order to read. That’s the reality of how non omnidirectional light bulbs emit light. Manufacturers that produce non omnidirectional light bulbs sacrifice quality to sell them for a lower price, which can cause annoyance and inconvenience when you use the bulb for common purposes. How to find an omnidirectional light bulb. Finding an omnidirectional light bulb is as simple as looking for the ENERGY STAR label on a product’s packaging. To earn ENERGY STAR certification, all A-line light bulbs must pass stringent testing and verification. One of the testing criteria is that the light bulb provides at least 270° of strong light, which ensures it functions as an omnidirectional bulb. If you’re looking to purchase omnidirectional light bulbs, click here. While we’re thinking about shadows this Groundhog Day (and hoping Phil doesn’t see his), remember that you have a choice as well to not see them around your home. 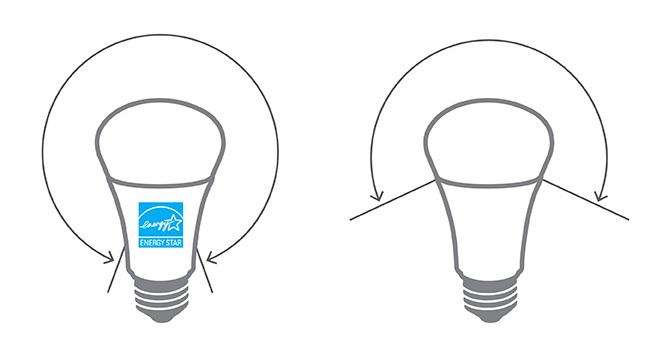 Look for the ENERGY STAR label when shopping for light bulbs and you’ll be shadow free.